Noted for his wit, wisdom, and elocutionary excellence, Rabbi Yissocher Frand, a rosh yeshivah at Baltimore's Yeshivas Ner Israel, is known throughout the world as a masterfully clear teacher of Torah. Wherever he speaks, rooms are filled to capacity. And as he speaks, the audience sits transfixed, absorbed, drinking in each carefully crafted phrase. 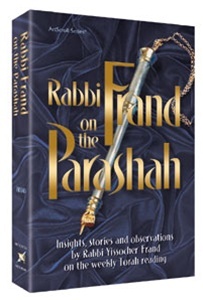 Over the years, Rabbi Frand's name has become closely associated with his thoughts on the weekly parashah - the portion of Torah studied weekly by Jews across the globe. Through his famed Parsha Perceptions Series, Rabbi Frand's message reaches thousands of listeners each week. Public response to the first two volumes of Rabbi Frand on the Parashah were strong. Readers wanted more. Drawing from the vast reservoir of Rabbi Frand's teachings, this third volume is sure to satisfy readers' earnest and eager appetite for more wisdom from one of Torah Judaism's finest teachers, and these provocative insights are certain to enhance Shabbos meals and celebrations throughout the year.